The first reading for Q1 2017 GDP came in at a weak .7% at an annualized rate. A particularly weak component of the report was consumer spending which rose only .3% and is the weakest level for spending since the fourth quarter of 2009. The blue portion of the bars in the below chart represent the consumer contribution to GDP and the weak report in Q1 2017 is evident. Over the past few years, first quarter GDP numbers have been weak for a number of reason. However, many believe there are issues with the government's seasonal adjustment factor. Nonetheless, is there something else impacting the consumer which could indicate potential headwinds lie ahead for the economy and is being reflected in recent credit card data? 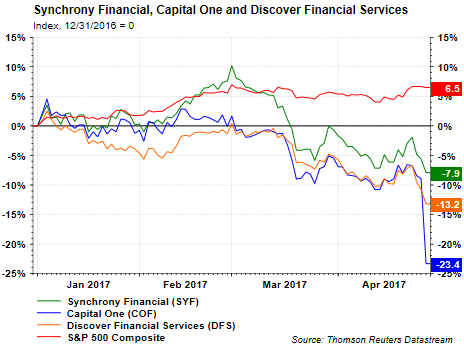 This past week, several financial firms reported earnings, Synchrony Financial (SYF), Capital One Financial (COF) and Discover Financial Services (DFS) and each company has a sizable portion of their business in consumer credit cards. Earnings for both SYF and COF were anything but positive relative to expectations. DFS earnings were not too weak and the company reported only a small earnings miss. Below are some comments from the company conference calls and/or earnings press releases. Net income fell 22% to $752 million while its earnings per share of $1.54 came in 39 cents below the average estimates of analysts. The company increased its loan loss provision by 30% year over year to $1.9 billion, as the 30-day plus delinquency rate climbed 28 basis points, to 2.92%. Meanwhile, net charge-offs rose 28% to $1.5 billion and its rate of net charge-offs to total loans increased 42 basis points to 2.5%. Most of the delinquencies and charge-offs were in the bank's credit card and auto loan portfolios (emphasis added). Company saw an incremental decline in recovery pricing this quarter. We believe it's driven by a combination of factors, including just the fact that you've got increased supply in the market. As charge-offs start to normalize across the industry, which we've seen, you've got that dynamic. So you've got just increased supply in the market, which we think is impacting the price. Discover Financial (DFS) also reported weaker earnings of $1.43, but the miss was only 3 cents. DFS also cited caution on credit and indicated credit card portfolios are normalizing to a higher more historical loss rate. DFS also increased the company's provision expense. The below chart compares the performance of the credit card firms to each other and the S&P 500 Index. The lower than expected earnings results had a negative impact on the prices of the stocks as can be seen below. 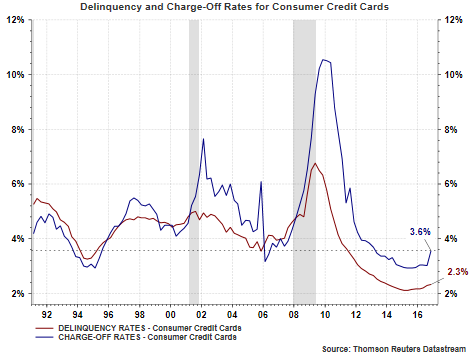 As the below table shows, credit card delinquency rates are below historical levels. On the other hand charge-off rates are trending higher and near economic late cycle levels. 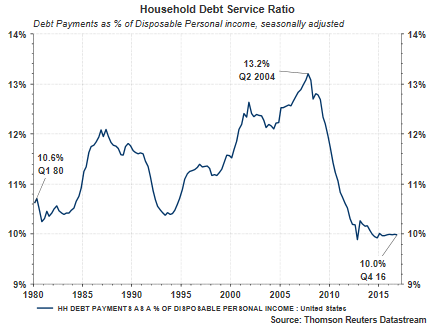 Supporting a leveling off for charge offs and delinquencies is the fact the household debt service ratio remains at a very low level. With charge-offs and delinquencies normalizing to higher and more so-called normal levels, maybe some stability is near. The fact companies are reporting lower loss recovery rates is also an indication of broader weakness in the credit card sector of the consumer economy. Recovery rate weakness occurs as the supply of delinquent credit card receivables increases and third party collection firms can pay credit card companies less for this type of loan paper. 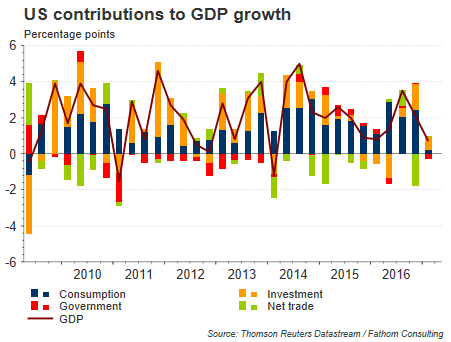 Given the much weaker GDP report in the most recent quarter and the weakness beginning to show up in credit card portfolios, these are yellow flags that investors should monitor for signs of further economic weakness. The current expansion is now the third longest since World War II and the economy will not expand forever. At this point though, based on other recession variables we review, we do not foresee a recession looking out the next 18 months or so. Since my post published nearly two weeks ago on widespread market bearishness and a potential indication of a market turning point, the S&P 500 Index has bounced higher by 2.6%. True to form, this overly bearish sentiment was followed by higher equity prices. Also, sentiment has improved with the AAII bullish sentiment reading reported at 38.05% today, a 12 percentage point increase. 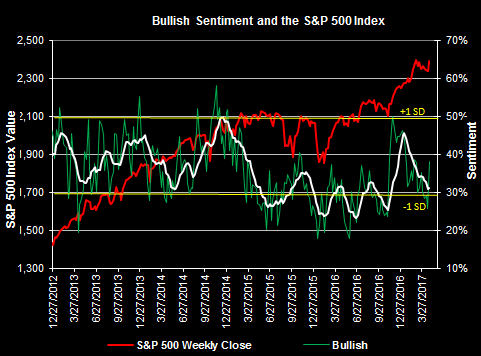 This improvement in sentiment has also seen the bull/bear spread flip to more bulls than bears at +6 percentage points versus last week's -13 percentage points. Although bullish investor sentiment has improved, the reading is not at a level suggestive of 'irrational exuberance." It has been several months since updating the performance of the Dogs of the Dow investment strategy. The strategy is one where investors select the ten stocks that have the highest dividend yield from the stocks in the Dow Jones Industrial Index (DJIA) after the close of business on the last trading day of the year. Once the ten stocks are determined, an investor invests an equal dollar amount in each of the ten stocks and holds the basket for the entire next year. The popularity of the strategy is its singular focus on dividend yield. The strategy is somewhat mixed from year to year in terms of outperforming the Dow index though. Over the last ten years, the Dogs of the Dow strategy has outperformed the Dow index in six of those ten years. As we noted in our early February post, it is important for investors utilizing the strategy to be aware of the strategy's bets in terms of stock and sector exposure. 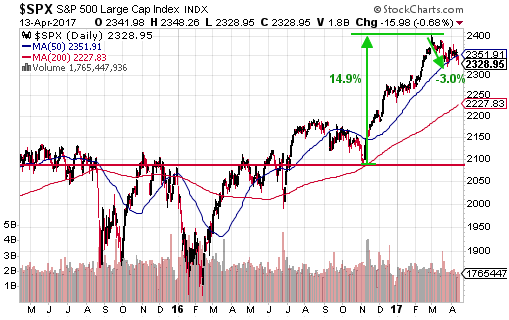 Through Friday's close, the 2017 Dow Dogs return of 2.0% trails the return for both the Dow Jones Industrial Average Index and the S&P 500 Index, 4.6% and 5.4%, respectively. Relative to the Dow Jones Industrial Average, the 2017 Dow Dogs are significantly over weight energy (19% versus 6.2%) and energy has been weak this year as can be seen in the energy holdings in the below table. Additionally, the strategy is overweight in telecom through its holding of Verizon. Other differences can be seen in the earlier post. 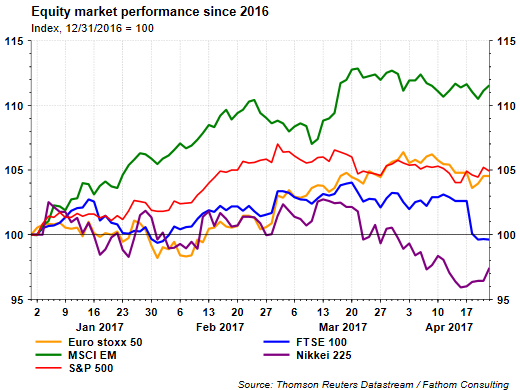 At least during the first four months of 2017, the pursuit of higher yielding stocks via this strategy has yet to be an outperforming one. In our Spring 2017 Investor Letter we briefly commented on first quarter investment changes we initiated in client accounts, specifically, adding exposure to emerging markets. Expanded commentary follows on some of the rational for this change. Simply because an asset class or stock is cheap does not necessarily suggest the asset should be purchased; however, valuation does tend to matter in the long run. 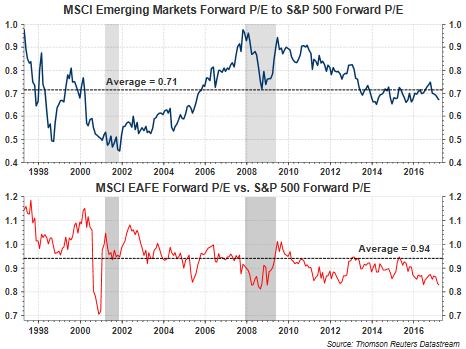 The below chart was referenced in our Spring Investor Letter and the top pane of the chart shows the relative valuation of the MSCI Emerging Market Index versus the S&P 500 Index favors emerging markets. 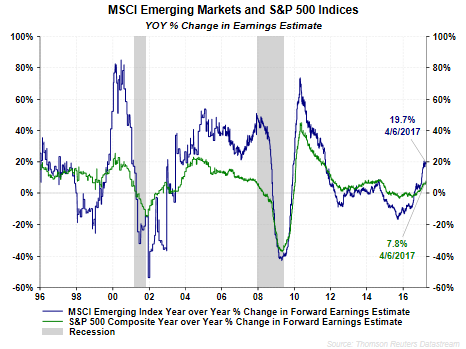 Additionally, when comparing the forward earnings growth expectations for emerging market equities and S&P 500 equities, emerging market companies that comprise the MSCI Emerging Market Index are expected to grow earnings nearly three times faster then S&P 500 companies. With respect to emerging markets, their prices seemed to be discounting the improvement taking place in global economies and the consequent benefit that should accrue to emerging market economies and thus emerging market stock prices themselves. Certainly, if global trade slows significantly, emerging market economies will be negatively impacted. However, our firm's view is developed economies will continue to grow over the next several years, even if at a below trend pace, and emerging economies will benefit. 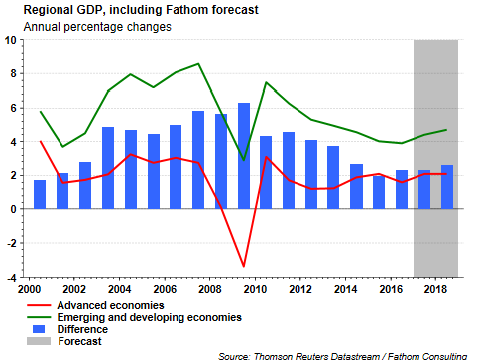 As the below chart shows, GDP growth in the emerging and developing economies has started to turn higher indicating a faster pace of economic growth than advanced or developed economies. This faster pace of economic growth tends to persist over multiple years. 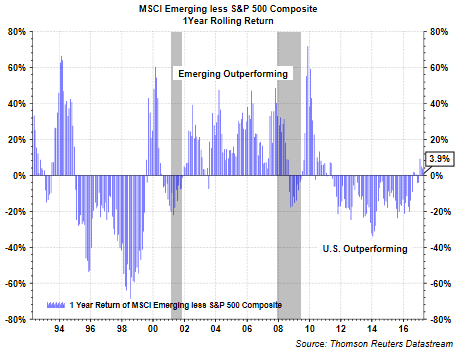 As a result, some investors are beginning to recognize this as emerging market equity performance on a year to date basis is outperforming a number of developed markets as can be seen in the below chart. 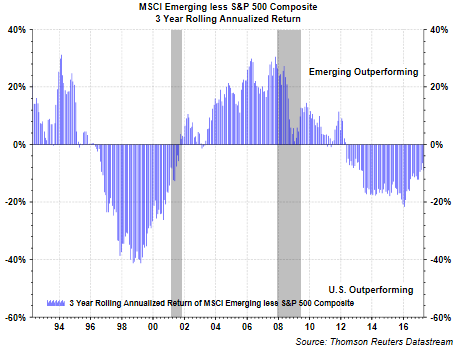 This recent outperformance is occurring at a time when emerging markets have underperformed the U.S. market on a rolling 3-year annualized basis for the past five years. The second chart below shows the rolling 1-year returns versus the S&P 500 Index and the rolling 1-year returns have begun to favor emerging markets in 2017. In investing, there are no certainties; however, with global economies seeming to become more synchronized with respect to economic growth, emerging markets could have a performance advantage over developed markets over the course of the next several years. Today another retailer announced it will be closing up shop, Bebe Stores, Inc. (BEBE), making it the 15th retailer to go under this year. By the end of May BEBE plans to liquidate its approximately 180 stores. 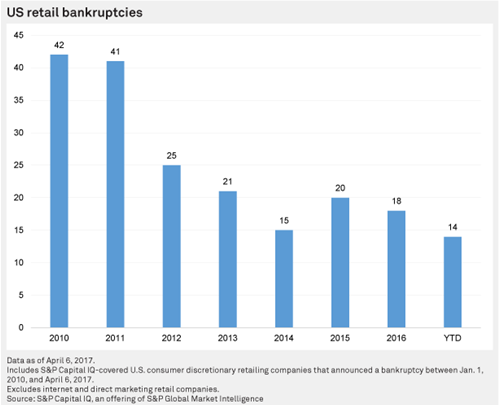 This nearly matches the 18 retail bankruptcies for all of 2016. With the consumer accounting for nearly 70% of economic growth in the U.S., are the struggles of brick and mortar retailers a sign of a weakening consumer? What the data seems to be suggesting is overall retail sales are growing at a decent pace. According to the U.S. Department of Commerce's most recent report on retail sales, it is noted, "Total sales for the January 2017 through March 2017 period were up 5.4 percent [versus] the same period a year ago. What is occurring though is consumer buying habits have transitioned to online or e-commerce sales versus a trip to the brick & mortar sores/malls. 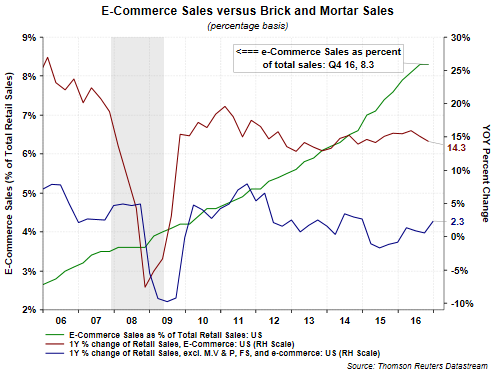 The two below charts show the break down of e-commerce sales and brick & mortar sales on both a dollar basis as well as a percentage basis. 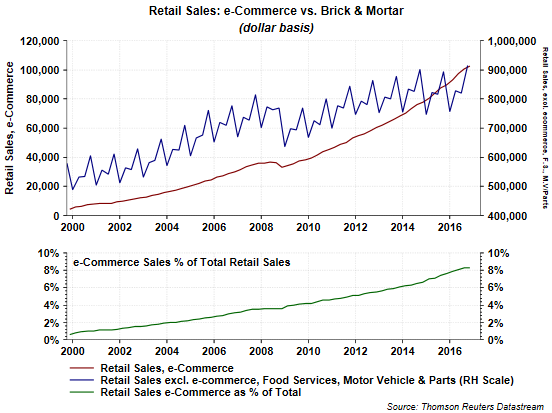 As the blue line in the above chart shows, brick & mortar retail sales are growing at a greater than 2% YOY pace. Certainly this is a slower rate of growth versus a few years ago; however, it is growth nonetheless. On the other hand, the growth in e-commerce sales is moving forward at a mid-teens pace and has done so for over five years. Consequently, the brick & mortar retail headwinds are mostly attributable to the changing buying habits of consumers and their preference for the convenience online shopping provides. This shift in buying habits, and now driven by Amazon, is covered in the below video presentation. The video covers Amazon and its destruction of retail and highlights the destruction of “brands’ that is occurring as a result of the growth in the preference of e-commerce buying. Bearish sentiment has over taken what was a bullish environment that unfolded after last year's election. The sentiment change can be attributed to a number of factors, such as continued gridlock in Washington, U.S. bombing campaigns in several countries overseas, etc. Most of the return generated by the equity market over the past two years has occurred since the election in November of last year. In spite of what seems like pervasive investor bearishness​ in stocks, the S&P 500 Index is down only 3.0% from its high at the beginning of March as can be seen in the below chart. Since March 27 spot WTI crude oil has moved higher by 11% increasing from $47.02/bbl to $52.25/bbl. This rise in price has occurred during a period when crude inventory levels in the U.S. continue to rise. This increase in crude inventory levels is taking place at a time when the drilling rig count continues to increase as well. 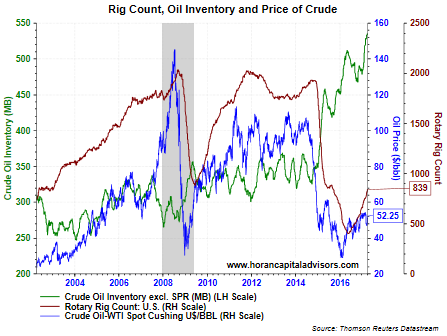 Historically, an increase in rig count has coincided with higher crude prices; however, inventory levels were much lower in the past when the rig count began to rise. Our Spring 2017 Investor Letter reviews the low volatility first quarter. Prior to March 21st, the S&P 500 went 109 straight days without closing down more than 1% en route to a 6.07% gain for Q1 2017. The first quarter market gains also came with unusually low volatility as measured by the VIX Index; the key index for measuring short-term volatility. Pundits have largely attributed the steady post-election market climb to the pro-growth policies of President Trump, but that does little to explain the even stronger performance in international markets. Developed international markets (represented by the MSCI EAFE index) ended the quarter up 7.39% and emerging markets, which presumably would be hurt by President Trump’s protectionist policies, were up 11.49%. The Investor Letter reviews a number of important economic variables noting the soft data points have certainly spiked higher and potentially pulling along the hard economic data points.